Letter to Deputy Superintendent of Public Instruction Salam Noor: Write Yours Today! 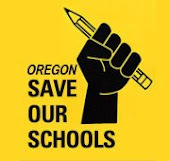 The following letter has been sent by Oregon Save Our Schools member Kathleen Jeskey to Oregon's Deputy Superintendent of Public Instruction (salam.noor@state.or.us) with a cc to Chief Education Officer and Education Policy Advisor to the Governor (lindsey.d.capps@oregon.gov). A copy has been sent to Governor Brown's office directly as well (https://www.oregon.gov/gov/Pages/share-your-opinion.aspx). Write your own letter today. Or link to this one and support. This is our opportunity. Take it. Thank you for taking the time to speak with my colleague, Joyce Brown, and myself after the ESSA Feedback Session in Woodburn. I wanted to write to follow up on our conversation because our time to converse was somewhat limited. First, I am happy to hear that ODE has heard that Smarter Balanced causes an imbalance in our schools regarding the weight of a single assessment to measure school quality. Joyce and I have been working on ESSA surveys from our Canby community and what we heard is that while parents want academic success for their children, they also want things like a welcoming school climate, a well rounded program, and most of all, for their children to feel safe at school. Many families mentioned that they would like their children to have smaller class sizes and more individualization. Not one family mentioned that they wanted more standardization. I understand the need to “take the temperature” at schools to ensure equity. Believe me, I am painfully aware of the racism that exists against my students and their families that impedes their opportunity. It is now trumpeting out from the highest office in the land. But we don’t need to test our students for 8 hours at a time to take a temperature. We really don’t, and I believe you know that. In fact, student and family surveys regarding school climate and comparing academic opportunity between schools would be more effective than a statewide testing system to eliminate explicit and implicit biases. The testing system that is being built is extremely expensive and is unnecessary in order for our children to be successful. And all the talk of registries lately has me greatly concerned for where student data goes once it is entered into the new multi-state longitudinal data system and how that data will be protected. There were also a couple of things about the session that I found somewhat disappointing. First, it was advertised as a feedback session so I assumed feedback on the ESSA plan would be taken. However, the questions at tables were instead focused on how to help implement the draft plan and what would be needed to help implement it, not questions that might elicit feedback on the content of the plan. I was also disappointed during our conversation following the session when my colleague, after detailing the many, many tests that our students take asked you, “At what point does the Oregon Department of Education advocate for our students to the feds?” You answered that ODE’s role is not one of advocacy but rather to ensure compliance with federal laws. I believe that the number one job of every educator in Oregon is to advocate for our students. My understanding of ESSA is that it gives us the opportunity to do so and puts that power in the hands of the states rather than the federal government. We could take the emphasis off testing by not only reporting measures of comprehensive education programs as well as test scores as part of the state report card but also by having our state Department of Education work to enforce a requirement of comprehensive, well rounded programs at least equally, if not more intensely, than enforcement of testing requirements. I hope you will strongly consider this when finalizing Oregon’s ESSA plan. Students and families deserve equity in inputs, that is to say programs and resources in their schools. Without that, equity of output (test scores) is unattainable no matter how long or how often we test children.